Theta oscillations are cycles of electrical activity in the brain occurring between 3 and 12 times per second. 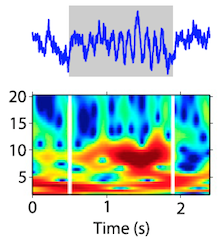 The onset of a saccade at t = 0 seconds appears to push the electrical activity in the hippocampus (blue graph) to have a more coherent theta rhythm. The multi-colored panel shows which oscillation frequencies are strongest at each time point. (Medical Xpress)—Quick eye movements, called saccades, that enable us to scan a visual scene appear to act as a metronome for pushing information about that scene into memory. Scientists at Yerkes National Primate Research Center, Emory University, have observed that in monkeys exploring images with their eyes, the onset of a saccade resets the rhythms of electrical activity (theta oscillations) in the hippocampus, a region of the brain important for memory formation. Tracking eye movements is already a promising basis for diagnosing brain disorders such as Alzheimer's disease and schizophrenia. A deeper understanding of how the rhythm of eye movements orchestrate memories could bolster the accuracy and power of eye-tracking diagnoses. The findings were published this week in Proceedings of the National Academy of Sciences, Early Edition. Senior author Elizabeth Buffalo was a researcher at the Yerkes National Primate Research Center and an associate professor of neurology at Emory University School of Medicine and is currently associate professor of physiology and biophysics at Universpity of Washington in Seattle. The first author of the paper is postdoctoral fellow Michael Jutras,, who is now an instructor at the University of Washington. Theta oscillations are cycles of electrical activity in the brain occurring between 3 to 12 times per second. Scientists have previously seen theta oscillations in the hippocampus in rodents, when the rodents were actively exploring, sniffing or feeling something with their whiskers. "Both animals and humans seem to take in sensory information at this theta rhythm," Buffalo says. "But one striking difference between rodents and primates is the way they gather information about the external world. Rodents are much more reliant on the senses of smell and touch." She says the actions that are most comparable to rodents' sniffing and whiskering in primates are saccades. When our eyes scan text or explore a picture, the eyes' focus tends to jump from point to point several times per second. Buffalo and Jutras examined electrical signals in the hippocampi of two rhesus monkeys while the monkeys were looking at a variety of pictures and the researchers tracked their eye movements. The researchers observed that after a saccade, the electrical signals in the hippocampus display a more coherent rhythm (see graph). "The eye movements are acting like the conductor of the hippocampal orchestra," Jutras says, "The phase reset might be a mechanism to ensure the ongoing theta rhythm is in sync with incoming visual information." Scientists have previously hypothesized that theta oscillations in the hippocampus set the stage for memory formation. The researchers tested this idea by presenting the monkeys each image twice during a viewing session. Because all primates have an innate preference for novelty, monkeys tend to spend a longer time looking at new images and less time looking at repeated ones. The researchers inferred that the monkeys had a stronger memory of a given picture if, upon second viewing, they looked through it quickly. The theta rhythm reset was more consistent during the viewing of images that the monkeys remembered well. "Based on this finding, we concluded that this resetting of the theta rhythm is an important part of the memory process," Jutras says. "This study has given us a better understanding of the function of the hippocampal theta rhythm, which has been well characterized in rodents but isn't well understood in primates," he says. "A future goal is to investigate the relationship between hippocampal theta and eye movements during memory formation and navigation in humans. This could be possible with epilepsy patients who undergo monitoring of hippocampal activity as part of their treatment." But what of people who do not have eyes??? Interesting: drinking alcohol impairs memory and changes eye movement. Coincidence? Maybe not.